I’ve recently been conducting research for the “Kits for Cultural History” project, focusing on an archaeology of early videogames. The games I’ve been examining were created before the rise of major game consoles and companies in the mid-1980s, and the graphics, sound, and gameplay mechanics of these early games are often deeply enmeshed in the technological constraints of the platform(s) on which they ran. Many of the techniques used to run these games on early arcade and home machines are being revived today by the indie game movement, although tracing a direct line from current indie games back to early videogames risks rendering game techniques purely aesthetic. As Carl Thierrien notes in Mark Wolf’s recent collection, Before the Crash: Early Video Game History: “Even with firsthand experience, one can misinterpret the actual algorithmic complexity of a game. This raises the fundamental question of the researcher’s competence to examine historical objects” (13). Studying early videogames from a historical perspective therefore invites an experiential, hands-on knowledge of the component material properties of game platforms and their role in shaping the game(s) produced—how, for instance, the particulars of early algorithms, electronics, and hardware influenced the articulations of play with computing. A Maker Lab kit on early games is meant to address the materialist and tinker-centric experience that a history of videogames demands, blending physical computing components, 3D models, schematics, fabricated mechanisms, and dynamic media with text-based scholarship. One goal of such a kit is to provide an embodied scholarly experience that makes an argument about the location of an early game within larger social, cultural, and political histories of technology and media. This approach is informed by Ian Bogost and Nick Monfort’s platform studies and builds on scholarship by Anna Anthropy, Anne Balsamo, Alexander Galloway, Kristen Haring, Steve Jones, Matthew Kirschenbaum, George Thiruvathukal, and Play the Past, among many others. For the balance of this post, I’ll discuss William Higinbotham’s 1958 game, Tennis for Two, as a case study for a cultural history kit, and conclude by sketching out some future directions. Created in 1958 at Brookhaven National Laboratories, Tennis for Two is considered one of the first early videogames. Its creator, William Higinbotham, sought no patent for the game, ultimately leading to his involvement in a patent dispute with Magnavox Odyssey’s Tennis and Atari’s PONG, among others. These better-known videogames came decades after Higinbotham’s creation, when early arcade platforms that blended analog and digital computing sat alongside mechanical coin-ops in arcades (and gradually entered people’s homes). Unlike these often better-known ball-and-paddle games, Tennis for Two was completely analog. It was created using a Donner Model 30 analog computer and an oscilloscope as the graphical display. As Higinbotham writes in his notes on the game, “the instruction booklet that came with this analogue computer described how to generate various curves on the cathode-ray tube of an oscilloscope, using resistors, capacitors and relays.” The analog computing that made the game possible is central to an archaeology of Tennis for Two because the game’s graphical display and expression are functions of its hardware platform. That said, many of us in the Maker Lab believe that tinkering with the construction of Tennis for Two—using, for instance, schematics, an oscilloscope, and a programmable microcontroller—would augment our reading-, writing-, and text-based approaches to media history, affording a tacit, hands-on understanding of how the game’s graphical and technical elements are intricately tied to historically contingent notions of gameplay. Even if the original Donner analog computer was simulated using, say, an Arduino microcontroller, a Maker Lab kit about Tennis for Two would still allow scholars to unpack the technical cultures and contexts that shaped the game’s tennis-based mechanic. The development of Tennis for Two can be traced back to the computing functions of the Donner Model 30, whose instruction booklet provides examples for calculating ballistic missile trajectories, bullet trajectories, and a bouncing ball (accounting for gravity and wind resistance). The use of the oscilloscope to display these trajectories also has an earlier historical precedent: before researching at Brookhaven, Higinbotham developed the first CRT-based radar displays (at the MIT Radiation Laboratory) that were later implemented in the radar tracking system for the B-52 bomber. Again, in his notes, Higinbotham writes: “This involved designing means to present the echoes returned from distant targets on cathode-ray tubes, in angle and distance, not far from the problems involved in the tennis game display.” Higinbotham also developed electronics for nuclear bomb deployment as part of the Manhattan Project. With this history in mind, the graphics and mechanics of Tennis for Two are deeply embedded in the link between early computing and World War II, since they emerge directly from computing tasks first developed for missile tracking. Working through the construction of the game via a hands-on kit would therefore help people wrangle with the historical contexts for Higinbotham’s game. And it would do so by treating the game’s attributes not as purely aesthetic matters, but rather as mechanisms and algorithms that could be tried and tested (based on historical details and documents). By extension, using computational methods for tracking ballistics during World War II in order to reproduce Higinbotham’s game could also provide a playable, physical argument about Tennis for Two. Such embodied learning and situational knowledge are what the Lab’s cultural history kits seek to offer, all the while acknowledging that we cannot play videogames like they did in 1958. Notably, Tennis for Two is not the only early videogame that employed analog computing. As Karen Collins notes in “One-Bit Wonders: Video Game Sound before the Crash,” early home and arcade videogames used digital methods to drive analog sound generators, including beepers (piezoelectric speakers), programmable sound generators, and even four and eight-track tape players. Music for these early games was written in low-level assembly language. 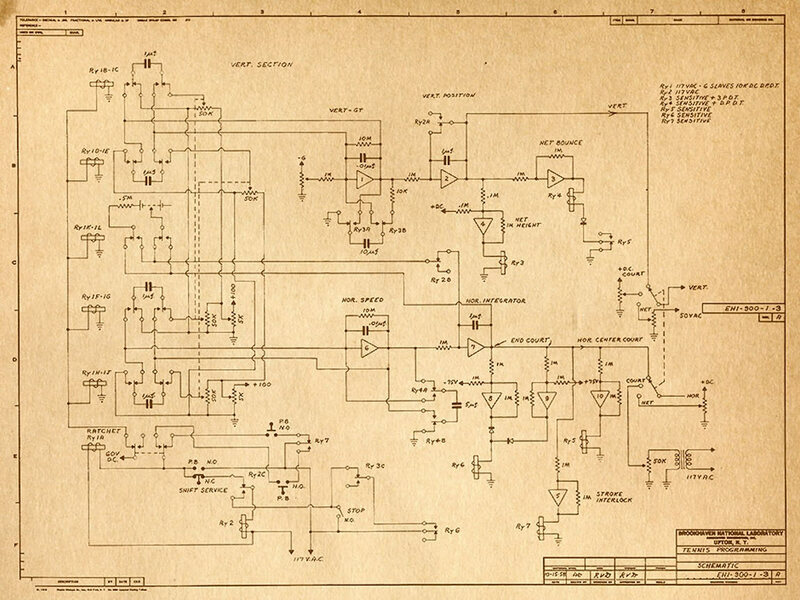 Rather than being abstracted from the hardware of the machine, early game sound was deeply embedded in the constraints of the hardware at hand. For instance, the PONG sound was created using the onboard sync generator (rather than a dedicated sound generator). This resulted in multiple versions of sound for the same game, which changed depending on the material components of each platform. The transition from analog to digital methods for producing early videogames largely existed before the formation of the game industry as we currently know it. Today, many aspects of these early games are accessible thanks to emulation software and retro indie games. The accessibility of physical computing components lets us tackle aspects of early videogames that emulation alone cannot offer, and to experiment with techniques for examining the machine behaviors of early games and game platforms. Understanding the cultural and historical conditions for many of these early game technologies reveals their place in the longer history of the twentieth century. These histories include the links between computing and World War II, but also the ties between computing and labor as well as the rise of mechanical gambling, penny arcades, and other amusement devices that began in the nineteenth century (topics that Erkki Huhtamo explores in “Slots of Fun, Slots of Trouble”). By providing a method for tinkering with—rather than simply describing—early game platforms, our “Kits for Cultural History” will prototype new methods for producing and sharing scholarship on early videogames and other old media. Anthropy, Anna. Rise of the Videogame Zinesters. New York: Seven Stories P, 2012. Burnham, Van. Superarcade: A Visual History of the Videogame Age 1971-1984 . Cambridge, MA: MIT Press, 2003. DeMaria, Rusel and Johnny L. Wilson. High Score! : The Illustrated History of Electronic Games. Berkeley, CA: McGraw-Hill/Osborne, 2002. General Instruments. AY-3-8910/8912 Programmable Sound Generator Data Manual, 1979. Galloway, Alexander. Gaming: Essays on Algorithmic Culture. Minneapolis: U of Minnesota P, 2006. Herman, Leonard. Phoenix: The Fall and Rise of Videogames. Springfield, NJ: Rolenta Press, 1997. Juul, Jesper. Half-Real: Videogames between Real Rules and Fictional Worlds. Cambridge, MA: MIT Press, 2005. Karen Collins. Game Sound: An Introduction to the History, Theory and Practice of Video Game Music and Sound Design. Cambridge, MA: MIT Press, 2008. Montfort, Nick and Ian Bogost. Racing the Beam: The Atari Video Computer System. Cambridge, MA: MIT Press, 2009. Raessens, Joost and Jeffrey Goldstein, eds. Handbook of Computer Game Studies. Cambridge, MA: MIT Press, 2005. Steven L. Kent. The Ultimate History of Video Games. New York: Three Rivers Press, 2001. Wolf, Mark J.P. Before the Crash: Early Video Game History Detroit: Wayne State U P, 2012. Post by Alex Christie, attached to the KitsForCulture project, with the physcomp tag. Featured images for this post care of Brookhaven National Laboratory and The Gamer’s Quarter.